Feeding the dolphins in Monkey Mia was great fun. We have also been dodging emus/cows/kangaroos and floods driving up the west coast! Actually, the flooding held us up a bit but we were soon back on track - and crossing the Tropic of Capricorn! We have been doing a lot of swimming and snorkelling (Craig saw a reef shark and turtle on the Ningaloo Reef!) at Coral Bay and Cape Range National Park near Exmouth. We both agree that our favourite place so far was Karijini National Park. It is stunning with great walks and beautiful waterfalls and swimming holes - very refreshing after a hot day's bushwalk! 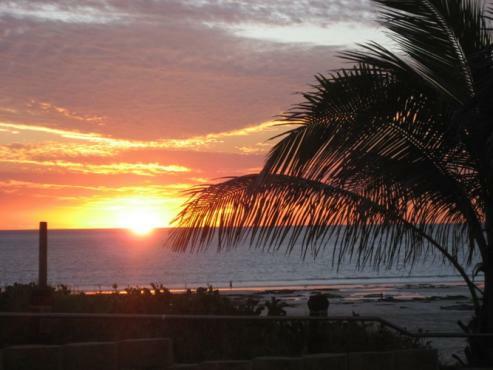 We also loved Cable Beach in Broome. The water was 30 degrees! We arrived in Darwin yesterday. It's hot, hot, hot here!